In this extract from ‘Gazza in Italy,’ the star’s brutal injury in the 1991 FA Cup final between Nottingham Forest and Spurs is recalled. THE FOLLOWING PASSAGE is an extract from ‘Gazza in Italy’ by Daniel Storey. Paul Gascoigne recalls the Tottenham club doctor being sent to the hotel room, where Gascoigne was kicking pillows and volleying bars of soap, to give him some tablets to calm him down. We can assume that these were Valium. When he was manic again before kick-off, Venables sat him down and tried to get him to breathe deeply and relax. Gascoigne himself says it was merely the pressure to show that he merited all the praise and mania that provoked his FA Cup Final actions. He wanted to prove the Tottenham supporters who believed him to be a mercenary wrong, and he wanted to make his family – who were in attendance – proud. This was also his chance to say a fitting goodbye to English football on the biggest stage. He had bought dozens of tickets at Wembley for his friends from the north-east. At that point, the deal to take Gascoigne to Lazio had been agreed, but only verbally. 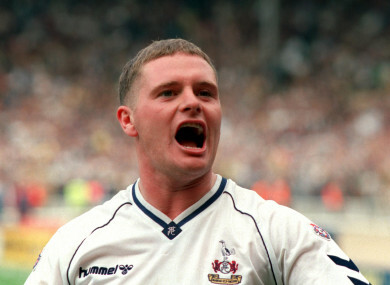 Gascoigne had not signed a contract because he wanted to go into the final with the mindset that he was still fully a Tottenham player. Within minutes of the start of the game, Gascoigne should have been sent off for a wild, high challenge on Forest’s Garry Parker, planting a boot into Parker’s midriff but only being penalised with a free-kick. and tempestuous, like an angry child kicking down his younger sibling’s snowman out of spite. Charles was incredibly fortunate to get to his feet unscathed, but Gascoigne required a minute of treatment before taking his place in the defensive wall. As Stuart Pearce’s free-kick flew past Erik Thorstvedt into the same Wembley goal where Gascoigne had scored so famously weeks before, the Tottenham star was slumping to the ground in pain. He had ruptured his cruciate knee ligament. With Lazio officials in the crowd to witness their impending arrival during his English football swansong, Gascoigne was rushed into an ambulance and to the Princess Grace Hospital in central London. Not only was he concerned that he had let down his teammates — he was obviously fearful that he had ruined his chance of a move abroad. It was to their credit (and a testament to Lazio’s determination to sign the player) that general manager Manzini and sporting director Carlo Regalia soon visited Gascoigne in hospital, taking him a Lazio shirt and a gold watch as a gesture of their commitment to the transfer and their relationship. With the media in England and Italy both reporting that the injury could put the move in jeopardy, it was just the comfort Gascoigne needed at a difficult time. ‘Gazza in Italy’ by Daniel Storey is published by HarperCollins. More info here. Email “'Gascoigne was kicking pillows and volleying bars of soap... The club doctor gave him some tablets to calm down'”. Feedback on “'Gascoigne was kicking pillows and volleying bars of soap... The club doctor gave him some tablets to calm down'”.